Have a pair of jeans from first-year that you’ve outgrown? Want to get rid of clothes so you can upgrade your wardrobe? We’ve got you covered. 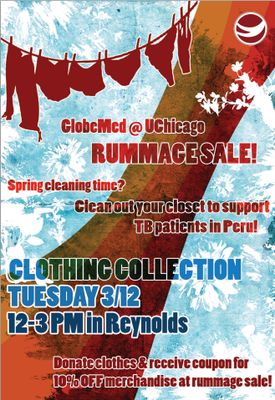 GlobeMed at the University of Chicago is now collecting donations for its annual Spring Rummage Sale! All donations will go to GlobeMed’s partner organization, ASPAT-Peru, a non-profit dedicated to curing drug-resistant TB patients in Peru. As an added bonus, anyone who donates to our clothing drive will get a 10% discount at our 9th week Rummage Sale next quarter! 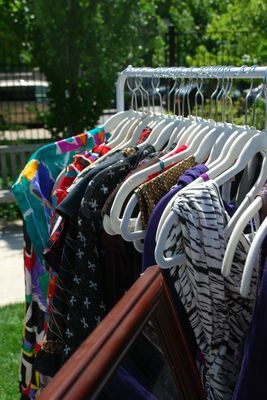 Bring any clothes (in good condition) to the Reynold’s Club between 12-3pm on Tuesday, March 12th (10th week)! If you can’t make this time, please email uchicago@globemed.org to set up a drop-off time with one of our members! Here is our post on marketplace. Spread the word!